If you get a pdf form that you need to complete and sign, you have probably wished for an easy way to sign your name directly to the form. Surely you are filling it out using PDF-Xchange, but it is a hassle to then have to print it out, sign it and return or by mail or re-scan the document and attach it to an email. Here are instructions on how to just stamp your signature directly onto the pdf document within your computer and never need to print or scan it. Sign you name in a typical signature size, on white paper with good dark ink. You can use either blue ink or black ink. Since you are going to scan the signature, you want to start with a good solid signature. Scan your signature as an image. Scan to jpg, png, and bmp or tiff. Do not scan to PDF as we will need to work with it as a graphic image and eventually turn it into a .png file. 3.1 Download Paint.NET. This is a free graphics editing program that makes it easy to trim a picture and set the background to transparent. It is easy to use and very well supported, so you might have other uses for it as well. 3.2 Cut the signature out from the rest of the paper. You don't want an 8.5" x 11" signature! Do this by selecting the signature using the rectangle select tool. Then pull down the Image menu and choose Crop to Selection in order to delete everything except the selected signature. 4. Make the background transparent. 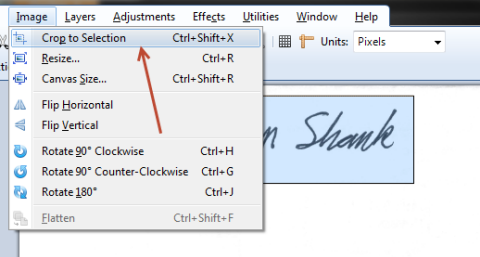 When you paste in your signature, you do not want the white background around your signature to cover nearby lines or text, so you want to make it transparent. To do this, use the Magic Wand selection tool and touch the background with it. The magic wand selects all connected stuff that is the same color. Then press the Delete key on your keyboard. Paint.Net uses the checkerboard to indicate that the selection was deleted. Actually it isn't deleted, it is changed to transparent. Find any left over white inside of characters and touch those with the wand and delete. You are almost done. Just two more steps. 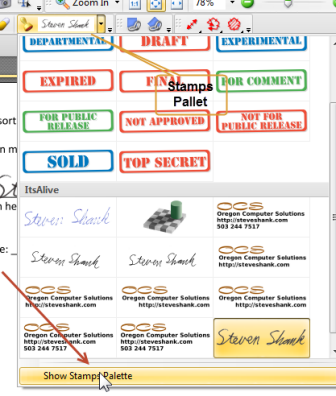 Open PDF-Xchange viewer and open the Stamps tool. Then choose Show Stamps Pallet at the bottom. You will only have the Standard stamp collection, but you can add your own stamps to your own collection. So, create a new collection and call it Signatures (or whatever you like). This will allow you to import PNG images into that stamp collection and use them wherever you like. Select your new Signatures collection and then choose From Image... Now import your newly created signature png. Now you can use it just like any other stamp and sign documents.